This past Sunday was Grandparents Day. I was reminded of this fact by my mother when I visited her in the nursing home Monday night as they had planned some special events around it. The sad reality is, however, that the occasion is no longer celebrated here in Canada. While it began in 1995 it was discontinued in 2014. Other countries though have designated a day in which to honour the important of grandparents within the structure of the family. I adore my grandchildren, but I will not be so pompous as to talk about the value I bring to their lives. What I will reflect upon instead is the impact my own grandparents had on my upbringing. The connection to my maternal grandmother came at a very early age, beyond my recollections. In the process of building a new house our family lived in the back of my grandparents home. As my father was also getting a new business off the ground, my mother took a job shortly after I was born to help out. Stepping in to nurture and care for me was Grandma. The stories go that much time was spent cuddling and singing. So much so in fact that by the time I was barely two I could croon a solid solo version of My Darling Clementine. My mother's father was a gentle man, a sketcher of realistic horses, a player of games and reciter of poems. I don't recall a severe look or tone from him, but felt a quiet strength within him. From my father's parents I discovered the charm of the farm, following in grandpa's easy steps to the barn and fields, watching grandma's unfailing work ethic from morn to night. My cousins and I enjoyed the freedom of acres of countryside while they quietly laboured and tended to our needs. Respite for them came in music, as Grandma found time each evening to play the organ, or in Grandpa's German lessons. I lost three of them while still in my teens, but I know how their presence enriched my life, if even for a short time. They were the calm in the storm, the quiet energy, the reasoned guidance. So, while Canada might have decided that paying tribute to grandparents by giving them their own day isn't important, I disagree. 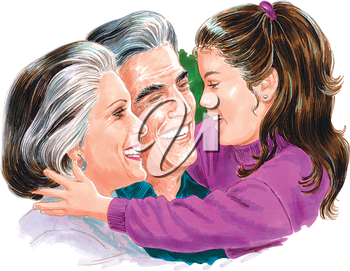 Today's clipart collections celebrate them and their place within a family.